I’ve been thinking a lot about sin, in preparation for this sermon…. And a memory came back to me that characterises sin for me. I was eighteen and an engineering apprentice. We had to learn how to weld and used various techniques, and it all went pretty smoothly, but the final type of welding required very, very high electric currents. I was with my friend Audrey and we were in a booth that had a metal table and a metal cage around us. The idea being that the welding stick had a high voltage that was earthed when it touched anything metal. So we were wearing protective clothing with a visor that was so dark that you could literally see nothing – it was pitch black and I stood in the total blackness in the booth waiting for her to begin welding. I did see one flash on the table and then after that there were flashes of light from over my head, to the right, to the left, back on the table, then over in another corner… all over the place – accompanied by crashing and banging. I was terrified. I couldn’t run because I couldn’t see and I couldn’t take the visor off because of the flashing arcs of light that would blind me. When Audrey had finally stopped she told me what had happened. She had accidentally welded the welding stick to the specimen, and then she was trying to shake it free, in the process she managed to crash it into the cage in various places and everywhere it made contact with the metal it earthed and so the arcing started. Why is this like sin? Well because I think what happens to me, and sometimes to others, is we have some issue that is perhaps unseen, a bit like getting the welding stick stuck to the specimen. Let’s say that issue is crushing unworthiness, or fear of the future, or a bad marriage, or a deep grief, or perhaps a desperate shame. But you don’t see any of that, you don’t know about it because it is hidden so deeply. What you perhaps see is me grumpy with my kids, super sensitive about certain things, you see me overworking, or eating too much, or you see me sullen in meetings… All these things are like sparks flying all over the place, and sometimes these are the things that we focus on as sins… but they aren’t ever going to be solved because they aren’t the real problem. The real problem is what happened in the darkness, the wrong thing got welded..! Turning to the passage, I have struggled more and more with it as the years have gone on. I’ll try to explain why. For a start Jewish Law says that people can only be accused of adultery if they were caught actually in the act. The law also said that both parties were guilty. So why is only the woman accused of it. Where is the man? It isn’t as if he wasn’t there when the Pharisees turned up. Why did he get away Scot free? Well presumably because being a man he was worth more than her. But what sort of betrayal is this? Betrayal of justice, betrayal of love….? Or is it worse than this. Is this whole thing a set-up? 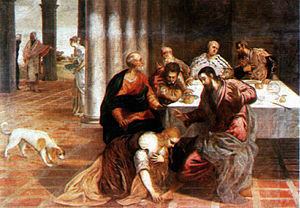 After all it is only the Pharisees who accuse her… and it seems very convenient that a bunch of Pharisees catch a woman in the very act of adultery in close proximity to where Jesus is teaching so that they can publicly test him and force him to choose between obedience to the Law and the mercy that characterises him. Perhaps she was forced to commit adultery? Then she was brought before Jesus. The text tells us that Jesus was sitting down and that she was forced to stand. My guess is that as they brought her straight from the act that she was naked, which is why Jesus mostly seems to be leaning forward, bowing his head, drawing in the sandy soil and protecting her modesty. It is a horrible scene of betrayal and humiliation, all with the aim of catching Jesus out. As a woman and as a priest I have heard horrific stories of abuse and humiliation such that I don’t think I can be shocked any more. For me, these stories wash over my consciousness as I read this story and I am transfixed and appalled by the scene that has developed. Perhaps you too know stories of shame and humiliation. I confess that as I read this story I have a growing anger towards the Pharisees. We don’t know whether the woman has transgressed in this way or not. But what about the sins of the Pharisees? What about the way they let injustice rule and they let the man go? What about the way they are publicly humiliating this woman just so they can continue their vendetta against Jesus? If they were concerned about her sin and thought Jesus could help then why not let her be clothed and go to him privately? Anger begins to burn in me. But of course I am doing exactly the same thing as the Pharisees. They are drawing tighter and tighter circles of sinfulness around her and I am doing the same to them. Jesus is different. He drew an expanded circle of sinfulness that included everyone present and then an even more expansive circle of forgiveness in the words “Neither do I condemn you”. Once we judge someone then it is difficult to hear God over the clamour of our own ego. Once we have judged then it is difficult to change our minds without losing face. We are called to be open and expansive, not to judge, that we might be able to discern God in amongst our everyday lives. To do this we need a soul that is at peace, not one that is awash with judgement, anger and pride. “Is the woman really guilty?” I find myself asking – I’m still struggling to get away from this judging mentality. Jesus said “Go and sin no more” – does he think she was caught doing something wrong? And how could he possibly know if he was clothed in the same humanity that we have, how could he know without asking more questions? Well, the truth is of course that all of us sin, including her. All of us fall short, and we flail around creating sparks here and there… perhaps some of us have deeper hurts that drive these things and we need to find the courage to deal with them. I heard a story about a woman who said to her Orthodox priest that she thought confession was useless for her – she didn’t do all those disgusting things that other people do. The priest replied that she should tell this to her husband and children and come back in the morning to tell the priest her decision on whether she wanted to confess. In the morning she came back a different person… and with a very long list. It is easy to let pride get in the way of our relationship with God. This is why in every mosque, when they do those beautiful mosaics, they always have some flaw in the pattern somewhere – to remind them of their humanness, their brokenness, their incompleteness. My second question is why the woman remains there once all her accusers have gone. Jesus is sitting down, the woman is standing there, possibly naked…. the text says that everyone goes – including the disciples and all the people who Jesus was teaching. They all slip away and the woman is alone with Jesus. What has happened to her? At the beginning of the story she was dragged along and forced to stand, now she is there voluntarily. Somehow, in all her nakedness and vulnerability, being with Jesus is safe. Knowing that she was a sinner and an accused woman, she still remains. I find this surprising, and then I wonder why. I wonder whether I can be naked before God, real and vulnerable. Is that an issue for all of us… and if so why? I wonder whether this Lent we can hear the words of Jesus “Go and sin no more” but also hear the words “neither do I condemn you”..? During this last week we have been reminded of at least two reasons to celebrate 2012. It’s 200 years since Charles Dickens was born. And it’s 60 years since Princess Elizabeth became our Queen. it seems necessary to go back to the beginning of these events. that he experienced poverty in his childhood. and that he was put to work as a boy in terrible conditions in a factory. and to help bring about social reform. This week we have also seen, pictures of the young Queen, on hearing the news of the death of her father, flying home from her holiday in Kenya. Dressed in black, she is met at the airport by the Prime Minister, Winston Churchill, and the members of her Government. And because of this beginning, 60 years later, we can thankfully celebrate this faithful dedication to our country. to be reminded of all that we celebrate here in our worship today. as the voice of Wisdom talks about rejoicing in the world at the very beginning of creation. One version of the Bible uses the word “playing” and speaks of Wisdom being God’s darling and delight. It speaks of a new creation where everything is as it should be and anything is possible. and riches and well-being in the other. An image of order, justice and righteousness. God’s beautiful creation we can surely celebrate today. But God seems to have taken this into his planning as well! In the beginning was the word….. Unlike the other Gospels, John begins not with human time, but with eternity. .
the eternal word of God. Jesus who embodies wisdom in his person and his teaching. – the darkness has not overcome it. – God still delights in the human race, in each one of us. to want the very best for us. For us to become children of God. So he comes to live among us, to draw us to himself in Jesus. as it was in the beginning. And if God delights in us then surely it matters to him how we respond . Cardinal Basil Hume says, in his book “Mystery of the Incarnation”, that we mustn’t worry about whether or not we have love for God. We just need to remember the simple truth that God is in love with each of us. It’s an amazing thought – that each of us can say “God is in love with me” “God delights in me”. It’s a mustard seed of faith which grows and begins to change us and our lives. It’s not something that happens overnight. and we’ll probably miss a few because we can’t or won’t watch and listen. and change and growth are very often uncomfortable or downright painful. But we are not alone. Jesus, the Word and Wisdom of God made flesh, is with us. He is our light and his life is the life that will never die. and that’s when we need each other. Our own light may go out for a while leaving us lost in the darkness. and can hold that up for us until our darkness passes. Then it may be our turn to hold the Christ light for someone else. There is darkness around us: but in that darkness a light shines and refuses to be overcome. A light which offers us new hope, new strength, new courage and new starts. The light of eternal life. God delights in us: there is no darkness that can overcome that light. His light which cannot be extinguished by any darkness of this world. I must confess that I struggled with this sermon all week. I had a hunch that I wanted to speak of light and darkness… and eventually I realised why I was struggling to preach on this… it is the concept of darkness – what does it mean, and are the models helpful? So the passage speaks of light shining in the darkness, and the darkness not overcoming it… but what is the darkness? Is the darkness evil? Perhaps, but for me, I find the concept of evil doesn’t help me very much, it tend to make me fearful, or paranoid. Sometimes it makes me project all my problems outwards instead of dealing with the root cause which is probably me. Sometimes I find Christians a bit illogical – they will say that you can tell something is worth doing because it is very difficult and the devil is clearly attacking it…. And then about other things they will say that you can tell that the Spirit is blessing it because it is so easy. I end up wondering if the Spirit or the Devil has anything to do with it or whether it is really their own desires…. Is the darkness sin? Perhaps, but for me, I find focussing on my sinfulness can leave me feeling guilty and worthless. Of course, there are times when I feel convicted of something that I have done wrong and I change my ways, I make amends, I confess what was hidden, I know God’s love and forgiveness and I feel so much better. “Better out than in” is an expression that comes to mind, but perhaps that is not such a nice expression…. But there are other times when I find that I just mess up a bit every day. I find a flash of anger and I shout at the kids, a flash of resentment and I get shirty with my husband, a moment of stupidity and I hurt a friend, a time of business and I neglect my own needs. For me, every day, there is the sincere desire to be the wife, mother and priest God has called me to be, and every day I mess up. I love that quote by Samuel Butler that “Life is like playing a violin in public and learning the instrument as one goes on.” I feel like I am a slow learner… but is that really darkness? You see, most of us, at some stage in our faith journey experience agonising doubt. It feels like we have lost our faith. It is a period of questioning, exploring, falling apart, doubting, dancing around the real issues, sinking in uncertainty, and indulging in self-centeredness. People around us think we are utterly lost. This sudden uncertainty is normally precipitated by a crisis, it makes former truths look like sham, we can’t make any sense of God and we can find no new direction, every route we take only results in more questions. Faith is no longer a support for us, it crumbles before our eyes, we feel remote, immobilized, unsuccessful, hurt, ashamed, or reprehensible. Prayer doesn’t work, church doesn’t work, whatever formula we previously had is now useless. This is a stage of faith and at the end of it, we hit something that some researchers call “the Wall”. It is impossible to go over, around, or under the Wall. One can only go through it. For me, when I had this experience, I called it “the abyss”… a sense of letting go of faith and of God and falling into the utter darkness. We don’t know it at the time, but it is the point where we integrate the spiritual part of ourselves with the rest of us, where we face our own and other’s demons… it is so unpleasant that we only enter this phase when we are forced to because of a crisis. The only end to it is when we fully and completely surrender to God’s will, even though we don’t even know whether God exists, and even though we remain in the dark. After the Wall we are never the same…. Is this darkness? I don’t think so. And so what is the darkness? Let me digress for a moment. A few of us watched a video by a preacher called Rob Bell up at St Mark’s the other day, and he had a concept of faith that is like a rhythm. And this song, this rhythm has been playing since the dawn of time, it is a song that moves us, and people throughout the ages have heard this rhythm and played along with it… and when we do something mean or we gossip or we steal or we lie, it is discordant… and when we see something kind or loving, it lifts our souls because the person is playing the song, the song that is within our soul. And it can be that people who say they have no religion play to the sound of the song, and others who are very religious confuse us because they seem to be hitting all the wrong notes…. And the song just keeps on playing. In the beginning was the “Word”… what on earth does that mean? Well it has strong resonances with the passage in Genesis… In the beginning when God created the heavens and the earth… the passage takes us back to the beginning of time, when the song was playing, even before anything was created… But why “the Word”? What does that mean? Again, it takes us back to Genesis, where things come into being when God’s intentions are spoken. 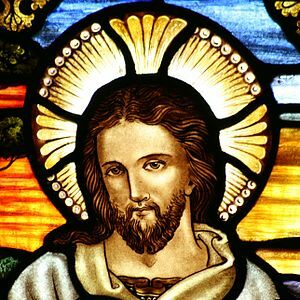 St John chooses to call Jesus “The Word” rather than “The Son” because in a sense, “The Word” makes Jesus and God more closely associated than “The Son”, after all many fathers and sons are quite different in nature. The Greek word translated “Word” in this passage is Logos, and it was common in both Greek philosophy and Jewish thought of that day. In the Old Testament logos was personified as the instrument of God’s will and in Greek philosophy logos described the intermediate agency by which God created the world. I see “The Word” as God’s breath, God’s intention, God’s song, God personified. Now John the Baptist came as a witness to the light… and that is the same for us. Our job is to try to listen to the song and to try to play in tune, even if we aren’t joined by others.. we need to keep playing. And we are the priesthood of all believers – each of us has a priestly duty to try to listen as best we can for the song, listen for God, look for the light and then to order our lives to that rhythm. victory is ours through God who loves us.